Rachmaninoff's Vocalise has been arranged for cello octet by Roland Pidoux, former principal cellist of the Orchestre National de France and professor at the Conservatoire de Paris. Mr. Pidoux is also the prolific arranger of cello ensemble music for Les Violoncelles Français, a cello octet who released their album Meditations in 2011. Sergei Rachmaninoff's original Vocalise is a song without words, sung on only one vowel of the singer's choosing. Rachmaninoff composed the Vocalise in 1915 and dedicated it to the Russian soprano Antonina Nezhdanova, who premiered it the following year. It has been the subject of many arrangements. 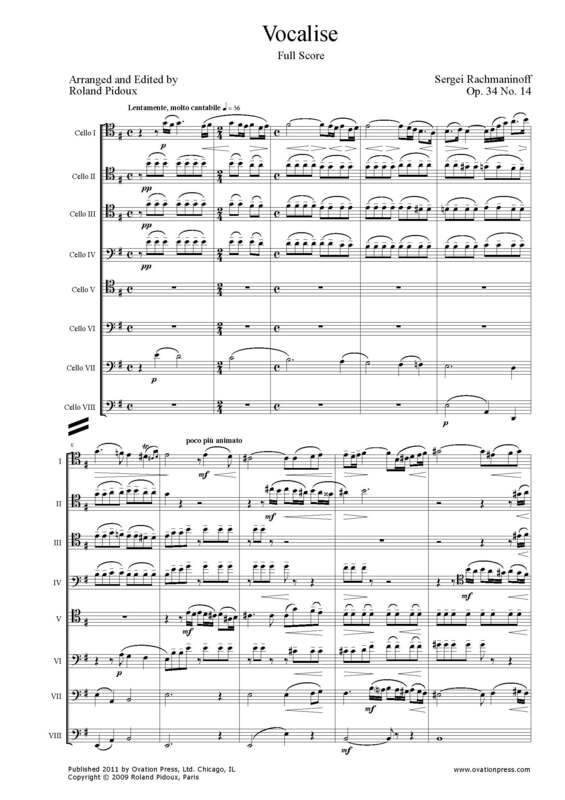 Download and print the score today to gain access to this expertly edited arrangement of Rachmaninoff's Vocalise for cello octet by Roland Pidoux! A pupil of Taneyev and Arensky for composition and Ziloti for the piano, Sergei Rachmaninoff was one of the leading figures of early twentieth-century Russian music. He went into exile in the USA after the 1917 Revolution. His Vocalise, like the Prelude in C sharp minor for piano, is a youthful work which has always maintained its popularity.